I don’t think it would be possible for me to talk about chicken and dumplings without also talking about the Vineyard House. Also, considering that we’re in the Halloween season, I think this will be the appropriate discussion. Growing up in the Sierra foothills I remember family trips to Coloma. Coloma is where gold was first discovered which sparked the gold rush. In the town of Coloma stands a cavernous mansion which was built in the 1870’s. 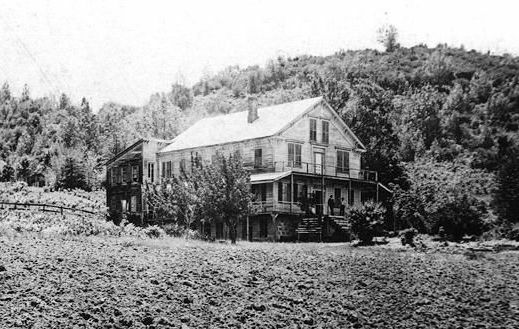 The enormous house was the center of activity in Coloma for many years. The building was converted into a hotel and restaurant in the 1970’s. I have great memories of going to the restaurant with friends and family when I was younger. It was a very popular place in this area and the wait times to be seated were substantial. While waiting, the kids had a great time exploring the old grounds while parents threw back a few cocktails in the dank and scary basement which also doubled as the bar. One of their specialities was their delicious chicken and dumplings which was in a rich chicken broth with fluffy parsley flavored dumplings. Everything was served on mismatched dinnerware which added to the vintage ambience. The house and the grounds were a profitable winery business for several years at the turn of the century. As the story goes, Martin Allhoff, the property’s founder, and his wife Louisa, migrated from back east during the gold rush as he was determined to achieve the California dream he had heard so much about back home. Having the good sense to give up prospecting and start a wine making business was a stroke of genius. By all accounts, he made a quality product and was quite successful. However, it was short lived. Unfortunately, Martin did not do a good job of paying taxes and keeping up on the books. When the law caught up to him on a wine delivery in Virginia City, he felt that he had no future and committed suicide by cutting his own throat in an outhouse behind a building. His lifeless body was subsequently sent back to his grieving wife in Coloma and buried in the cemetery across the street from the house. Soon after, Robert Chalmers of Coloma began a relationship with Louisa and together, they continued the business. After a time, however, Robert started to show signs of mental illness and considering the lack of professional help at the time, his new wife Louisa had to make the painful decision to lock him in the old prison cell in the basement to keep him from hurting himself and others. Considering Robert’s mental condition, he began to suspect that Louisa had ulterior motives when she came to give him food and water. He believed that he was being slowly poisoned! As such, he refused to eat and painfully perished over time. Louisa passed on shortly after. Both Robert and Louisa are buried across the street from the old house in the Coloma Pioneer Cemetery. Tragically, the once admired house fell into disrepair for many years thereafter until it was later revived as a local landmark restaurant. Sadly, the long history of trouble couldn’t be denied and even the successful restaurant fell victim and eventually closed. The Vineyard House is currently occupied by a private family which keeps very quiet. Many locals believe that the house is actually occupied by more than just the current owners of the property. It is said that the tragic events surrounding the Vineyard House have sentenced the tortured souls of Martin, Louisa, and Robert to forever wander the hallways and rooms of the grand old house in search of the California dream which was always just beyond their grasp. 1/4 cup various fresh herbs parsley, rosemary, thyme, etc. Add your oil, onions, carrots, and celery to the bottom of a large pot or dutch oven. Add a little salt and pepper and sauté ingredient for about 2 minutes. Place your whole chicken in the pot and add water to cover. Add the thyme, parsley stems, and bay leaves. Bring the pot to heat and simmer for one hour. Once finished, place the whole chicken in a bowl to cool, and strain the resulting liquid to another pot and return the liquid to the stove top on low heat discarding the vegetables. Meanwhile make the dumplings by combining the flour, baking powder, and salt in a bowl. Sift the dry ingredients through a fine sieve. Add the herbs to the dry ingredients. Add the melted butter and milk. Combine to make the dough. Don't over mix! On a floured surface, spread out the dough or roll it to about 1/3" thick. Cut the dumplings into 1" squares. Carefully and individually, place all of the dumplings in the simmering chicken broth. Set your timer for about 45 minutes. Meanwhile, pull all of the meat from the chicken and place it in the pot with the dumplings. Salt and pepper the mixture to taste. At this time, also add the sherry. Ladle hot soup and dumplings into bowls and garnish with the parsley. Serve hot! Actually according to all the research I did, Allhoff’s agent in Virginia City was the one who did not pay the taxes, pocketing the $$ instead, and Allhoff went there to straighten things out with his documents, but was so embarrassed and humiliated by being arrested and not taken for his word that he went on to commit sucide.That is also what his sons wrote in documents in Coloma Museum. Prison cells were not put in the basement until after El Dorado County started using the basement for holding prisoners and that was after Robert Chalmers died. There was probably another small house between the main house and the distillery where the brandy was made where Chalmers was held with a “nurse.” Louisa lost most of the acreage to the Chalmers and Allhoff sons over court cases and the will. She was left with about 10 acres of land and the house after paying off the lawyers. Louisa went on to become Mrs. Hardy and the Vineyard House became Mrs. Hardy’s boarding house and that is when the bars were added to the basement. She was paid about $1 a day for each prisoner held there. There were a few hangings held outside the northern end of the house. Young Louisa went on to become a nurse in San Francisco and died about 20 years before her mother. Louisa Wheeler Allhoff Chalmers Hardy lived long past her husband. During World War II German prisoners of war lived at the Vineyard House and helped the farmers around Coloma. That is a part of the house’s history that few know about. Jeanine, thanks for the feedback and further detail on the Vineyard House. I’m glad that there is someone out there, other than restaurant staff, keeping the story straight! Fascinating . Our Speech Final for the American River College class in the old college on the hill above Raleys (where I graduated before going to CSUS) was held there in the Vineyard House. Upon completion of my ‘humorous’ speech my husband stood up with the chair still attached to his bottom where he had fell though the reed bottom during my speech giving us the final laugh of the night (and me an “A”) We then went to the bar in the basement. Haha! I love it. There has to be so many great stories of that place. Thanks for sharing!